Change of theory Mr. Darwin! I close my note book. My flight lands. Without a second look, I await my destination. So I walk towards the conveyor belt, grab my luggage and head towards the doors into - food heaven - Singapore! This was my motto for the food trail ! As I step outside the airport enclosure a lovely Singapore morning greets me. 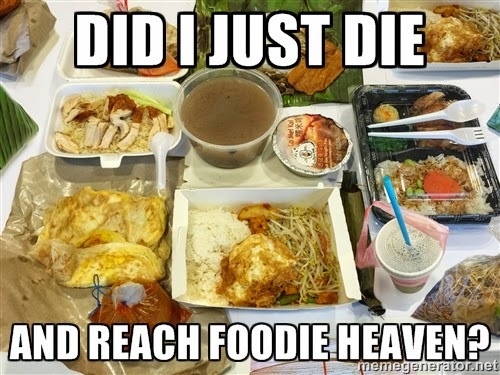 I was jet, set and ready to go on a mini food trail in Singapore - in 24 hours. I had noted down the dishes I just had to try in my notebook. 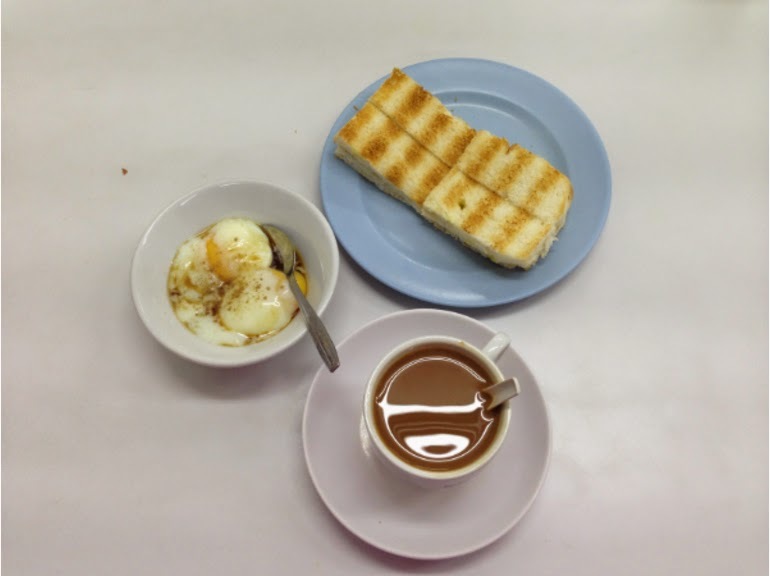 I am told by the cab driver to not miss sampling the breakfast that powers Singaporeans daily - Kaya toast with soft-boiled eggs and a piping hot kopi (coffee) or teh (tea). The Kopi and Kaya Toast culture originated from the Hainanese cooks who used to work for the British as cookboys. This was where they learnt to make coffee and toast. Listening to the way kopi and teh is pronounced reminds me of how it's pronounced in a similar fashion for kaapi and chai back home too! Toast Box. And glancing around the restaurant at others 'breaking their kaya toast' I emulated. I dip my toast into the soft cooked eggs drizzled with soy sauce and a sprinkling of white pepper and devoured it. I wash this down with the syrupy Nanyang-style kopi. Some sightseeing and shopping later, it was almost lunch time and the next stop on the food trail was grabbing Singapore's unofficial National dish - Chicken Rice. 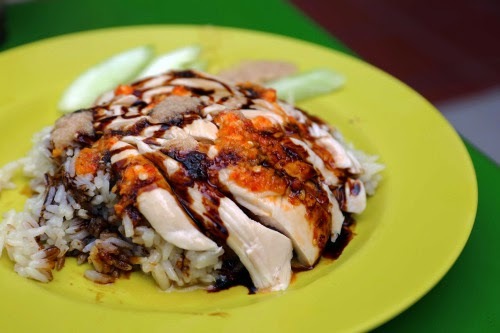 It is much more than just another tasty dish, chicken rice to Singaporeans is akin to 'soul food'. I walk to Tian Tian at Maxwell Food Centre and grab a seat and wasting no more time, I order 'Chicken Rice'. I am told that Anthony Bourdain, Gordon Ramsay and Dr. Leslie Tay have graced this restaurant and I cannot wait to sample it. I get a generous serving of chicken chunks with sweet dark soy sauce to accompany steaming Haianese rice. I indulge as any typical Singaporean would - drizzle a generous amount of sweet dark sauce onto the steaming rice, “dress” a chunk of chicken in the chilli sauce, and then heap a dollop of minced ginger on top of it. The condiments balance all the flavours of the rice, chicken and the sauce and give me a wholesome experience. 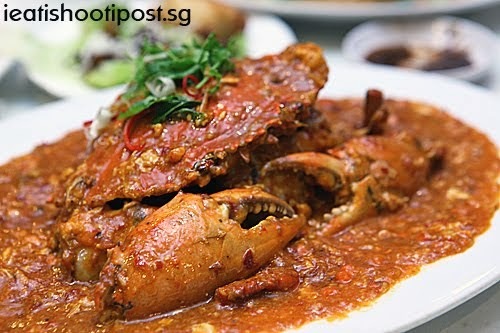 'You cannot leave Singapore without tasting our Crabs' my dad had said. 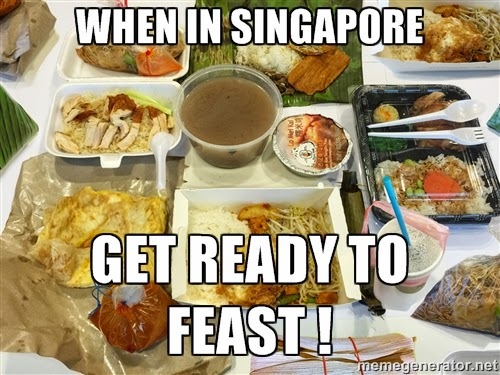 How can I miss out on the de facto National dish of Singapore? With that thought I get all nostalgic and remember home. And home food reminds me of my fondness for seafood. I head to Roland Restaurant and I am greeted with the aroma and the bright sight of Chilli Crab. I bite into the succulent fleshy crab and take my time to grab all the beautiful flavours! Lip Smacking ! Satiated with my extravagant lunch, I then take a cab to hop over to a popular stretch of eateries along Upper Thomson Road and over to Sing Ming Roti Prata for my next food destination in my trail - Prata. Flaky buttery goodness with chewy insides and a dough that is a fresh mix of flour, eggs, sugar, salt and water is what maketh a good prata. It might sound familiar like the home made paratha and I am told that it is loved by many in the South East Asian subcontinent. I love the fact that the prata is like the south east asian cousin of the Indian parantha -Simply adore the confluence of cultures in food ! After a short break, I continue on and I remember from the geography class back in school of Singapore's famous fruit and local produce - Durian. I cannot miss this opportunity to sample this one-of-a-kind fruit so I head to the market to find it. 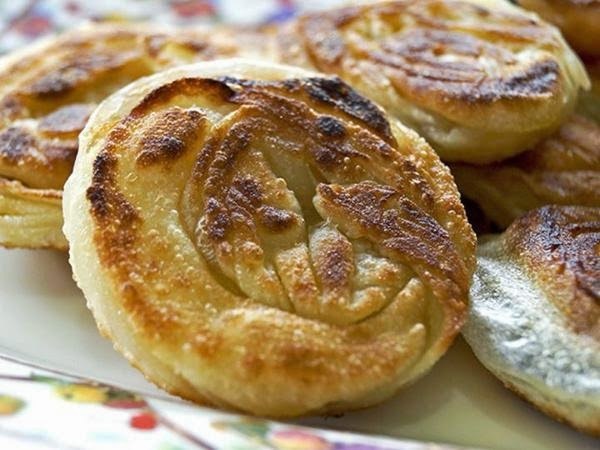 I notice that the Singaporeans have certainly found ways to include this pungent fruit in many desserts and sweet concoctions and one of them is: chee cheong fun (steamed rice rolls). I head to 89 Killiney Road and over to Rice Roll & Porridge shop to get my durian fix. 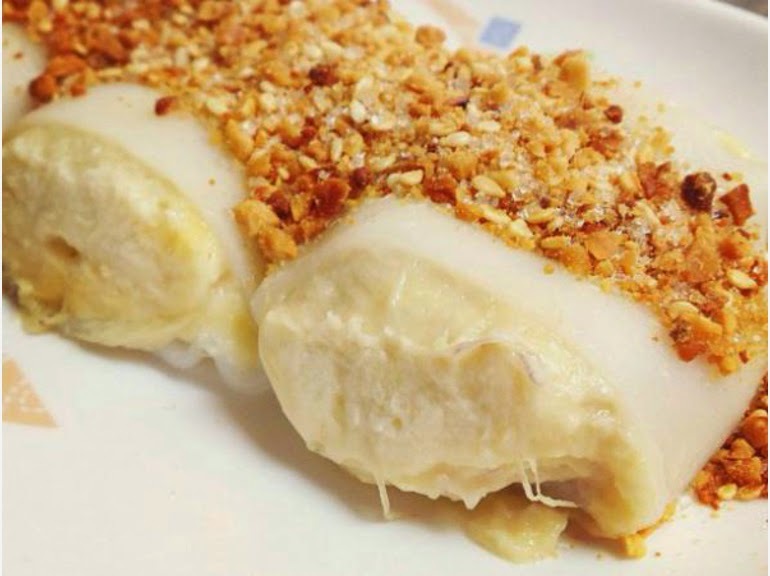 I waste no time as soon as I get my order and I bite into the chilled roll that is stuffed with durian flesh and topped with a mixture of ground peanuts and sugar- YUM ! With that yummy treat and ended my delicious supper. Only a couple of hours before I was to leave for home. How I wish this trip wouldn't end ! Heading to the airport I was still savouring the amazing flavours the culminance of cultures I had experienced in the last couple of hours. I bought a souvenir for myself to remember this culinary journey and mainly Singapore. My trip was really memorable all thanks to all the information I got through http://discover.stayfareast.com/ to made my culinary trip to Singapore truly unforgettable ! It's a matter of taste after all. PS. This is a my fictional account of a foodie trip to Singapore. A Family: #Together Forever ! survivaloftheoptimist by Gauri Kamath is licensed under a Creative Commons Attribution-Noncommercial-No Derivative Works 2.5 India License. Based on a work at survivaloftheoptimist.blogspot.com.